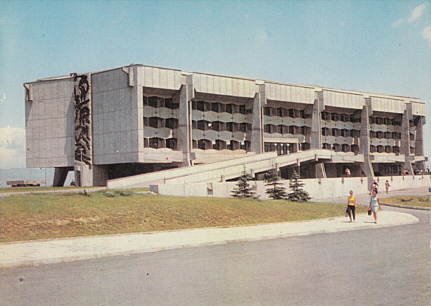 Sports and multi-purpose hall, built 1968 for the 9th International Youth and Students' Festival. Used mainly for sports, but also for exhibitions, shows, concerts and conferences. 2017 renovations, re-opened as "Asics Arena". Reverse Text: "Sofiya - Zala 'Festivalna', Sofiya - Festivalnnyi zal, Sofia - La salle 'Festivalna', Sofia - Die Festivalhalle"